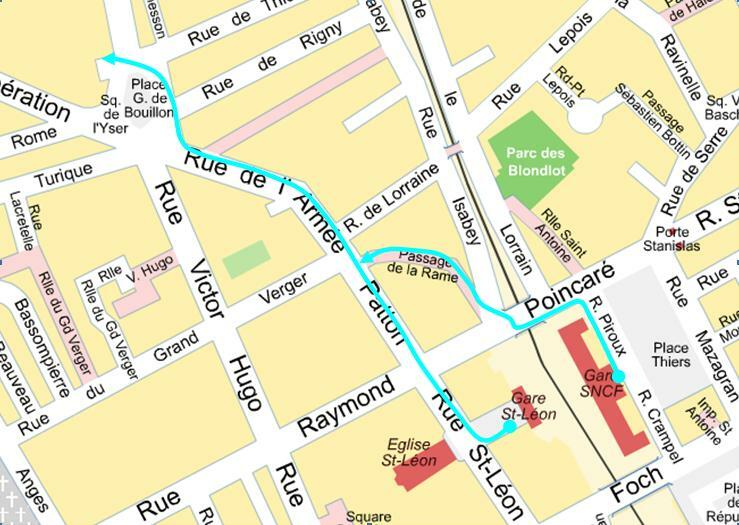 How to get to Nancy 2 Arts and Humanities CampusGetting to the campus on foot from the railway station:The Université de Nancy 2 Arts and Humanities Faculty Campus (Campus Lettres Sciences Humaines) is fairly centrally situated in the city. It is a short walk (700 m/less than half a mile) from the main train station, whether you exit the station on the Place Thiers side or the rue Saint-Léon side. Paris (Roissy) Charles-de-Gaulle Airport: There are around two direct high-speed trains per day running directly between Terminal 2 of France’s biggest airport and Gare Lorraine TGV station twenty-five minutes north of Nancy by motorway (coach shuttle to Nancy). See above (‘Getting to Nancy by train’) for more details. The journey takes around an hour and a half. The comfort of taking a train directly from the airport, avoiding transit through central Paris, might offset the disadvantage of the potentially long wait engendered by the infrequency of these direct TGVs, and the fact that you do not arrive directly in Nancy—something to look into, and for which your flight time would of course be a factor. Alternatively, it is of course possible to take light rail (‘RER’) from Paris-Roissy CDG Airport to central Paris, taking RER line B, arriving at the railway station Gare du Nord, and then either making the short journey on foot (5-10 minutes) from Gare du Nord to Gare de l’Est (train lines out east from Paris and so to Nancy), or taking the metro (line 5, direction Place d’Italie) between the two stations (only one stop via metro). The RER trip from the airport to Gare du Nord takes about half an hour. Parisian public transport (RATP) information is available in English here.